Part CSIRO owned business, The Healthy Grain Company, has appointed a former Chief Executive Officer of George Weston Foods as the Chair of its board. Andrew Reeves will join The Healthy Grain Company as its new Chairman, bringing with him his George Weston CEO experience, along with leadership and marketing experience at Smith’s Snackfoods, Coca-Cola Amatil and Lion. The Healthy Grain Company owns the rights to two CSIRO developed grains; BARLEYmax and Kebari. 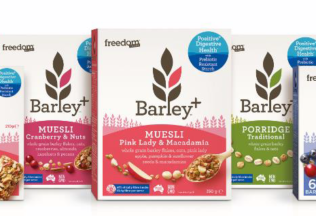 BARLEYmax is a high-fibre barley, whilst Kerbari is a barley that is very low in gluten. The CSIRO owns one-third of The Healthy Grain Company, whilst approximately one other third was sold to Japanese Company, the Teijin Group, in early 2017. Chief Executive Officer of The Healthy Grain Company, Robert Burbury, said Reeves’ appointment was a critical next step in the growth of the business. “He brings a wealth of industry knowledge and experience, which will be invaluable as we continue to grow the THG business globally with our exclusive ingredient range,” Burbury said. The Healthy Grain Company recently acquired rights to the Kerbari grain through an exclusive global licence with the CSIRO. The grain is recognised as gluten-free in the United States and Europe. It has already been used by the CSIRO to make gluten-free beer for outside Australia. As Kerbari still contains a very small amount of gluten, it cannot be promoted as gluten-free under Australian law. Unilever’s Continental is now selling three new cooking aid ranges in Australian supermarkets. Mexican fast food chain Taco Bell is set to open in Australia again.